Steph is spending a year as a Step into the Gap volunteer for CAFOD and is working at Good Shepherd parish in Nelson, Lancashire. Here is an update on her visit to Nicaragua. We have just come back from an amazing few days staying in rural Nicaragua up by the Honduras border. 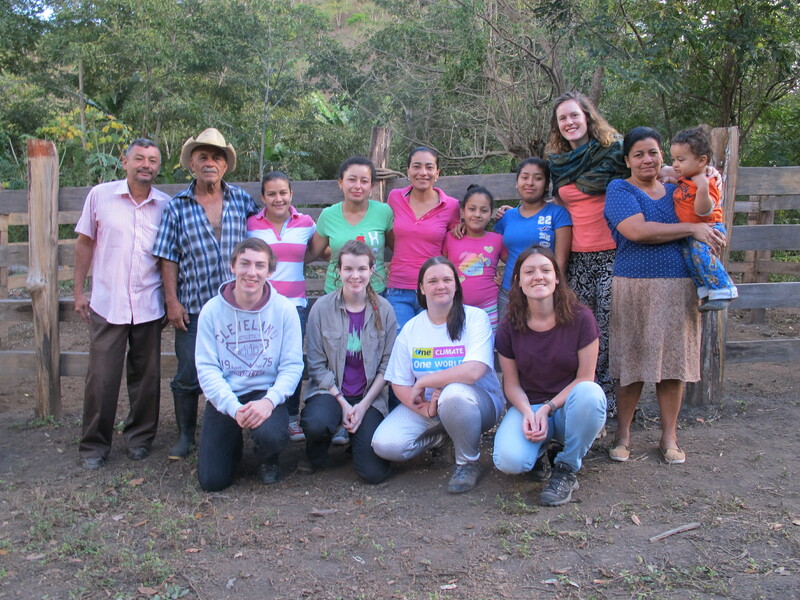 We stayed with Elizabeth on her family farm called ‘Gracias a Dios’ (Thanks to God). Elizabeth works for ASOMUPRO, one of CAFOD’s partners, so she was our guide for the week. She lives with her parents; Dona Ada and Don Angel, her two younger sisters, her cousin and her brother, his wife and their son Arron on a gorgeous farm complete with pigs, cows, horses, a donkey, hens and dogs! Elizabeth is a technical support worker, someone who visits the surrounding communities where ASOMUPRO works. She is the local communication link with the main office in Managua as well as the more local office in Esteli (still three hours’ drive away). She checks up to see how they’re getting on, to provide support and communicate any training they might want to go to. Locally she works with the Natoso bee keeping women, the kitchen garden women in San Fernando and Dona Helen in Jicaro as well as many other groups. All the girls, (six of us as we had Bryanna, an intern at ASOMUPRO travelling with us also) shared one room, while Chris and Marvin (our driver for the week) had their own. 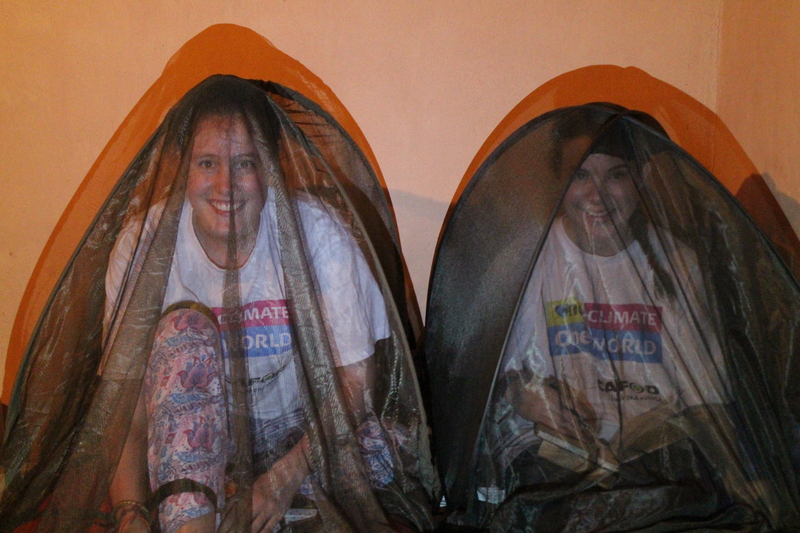 Mosquito nets were vital here so imagine six individual nets up in one room, sleep walking was not an option for Vicky! Although it was just Chris and Marvin in their room, they were often joined by others. One evening they came back to a hen laying an egg on Marvin’s bed, and another time they had a spider so big Chris came running into our room for help! Despite the language barrier between the two of them, all we ever heard from their room was laughter, they certainly found their own way of communicating! The first morning we were all awoken bright and early (around 5am) by the sound of cockerels, and their donkey braying which made us all burst out laughing. Now it was time for us to try out the cold outdoor showers. This involved scooping bowls of cold water over us, at 6am when the sun was not yet providing any heat, needless to say they were quick! Except for Chris who I think secretly enjoyed it! The sun rose over the front of the house which was where they had a hammock, somewhere we often raced to get to first! Elizabeth’s mother Ada, spent her days in the kitchen preparing tortillas and coffee over the clay stove. Rice, beans and tortillas are a staple part of the Nicaraguan diet and are often eaten at every meal. Ada was a great cook though and found lots of different ways of cooking them which were all very tasty. Not forgetting the bananas, who knew they could be cooked in so many different ways?! There was always coffee brewing, homemade Nicaraguan of course, which as a coffee drinker myself should have been perfect. However it seems to be a custom here to add A LOT of sugar before it is poured out. This makes it very sweet tasting, great for some people but I unfortunately didn’t take to it so much. We each had a go at making the tortillas, all by hand no rolling pin in sight. Obviously we were all very much put to shame by Elizabeth’s youngest sister who is only 10! We were also shown how the coffee is made; the beans first of all shelled using a pestle and mortar, then roasted in a pan over the stove, then ground at the local mill, then put in a sieve and boiling water poured over it to provide the coffee! One morning Elizabeth’s father Angel let us try milking the cows, by hand. This provided a lot of entertainment watching each of us try to get as much milk as we could from the poor cows, who had probably never had to stand still so long! It was definitely harder than it looks, although Angel had done it every morning his entire life. 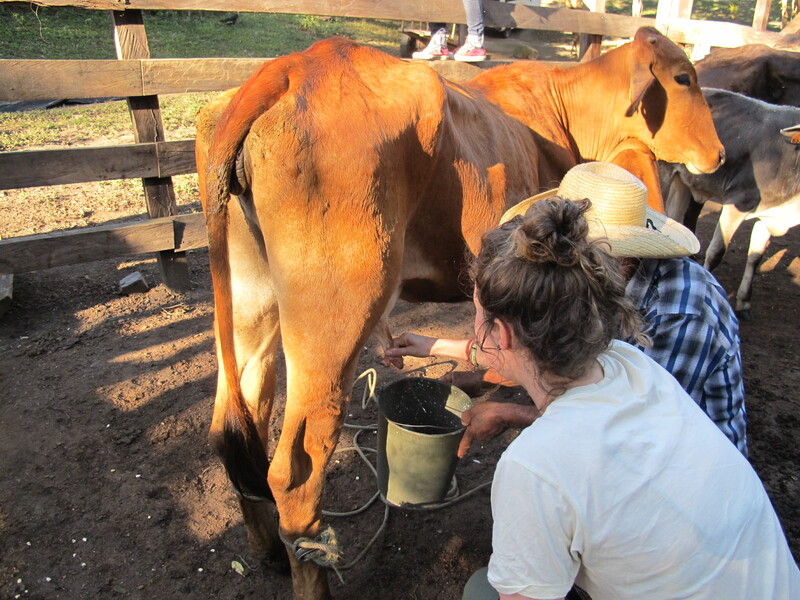 It was then time for the six monthly vitamin injections to the cows, which only Chris and Tania were brave enough to try! We were all dying to try out riding the horses, they had three including one who was 9 months pregnant (12 months in total!). Most of us had only ridden horses once or twice before but these horses treated us well and we absolutely loved it. It was so peaceful and relaxing (also very good for the posture) riding along the rocky dirt path roads with the sun beating down and just the sounds of nature. I haven’t yet mentioned Dexter (our minibus). He provided us with a lot of entertainment during the week, mainly because to get to Elizabeth’s farm the surrounding roads were very bumpy. And to get into her farm off the road was a hill something a 4×4 would have struggled with. Poor Dexter took three attempts per time to get up, always a hairy moment that we would come crashing back down again. It was very impressive that we got him back to Managua in one piece and the deposit back! Elizabeth’s family could not have made us feel more welcome into their family home and even after just three days we were all very emotional to leave. Language was never an issue between us and I definitely felt my Spanish improve during these few days, my understanding at least and speaking I progressed from odd words to full sentences which felt quite an achievement. Personally I could see myself living there for a few months at least! Definitely a country girl at heart, I can only hope to return one day. Reblogged this on victoria ahmed. thanks goodness for those mosquito nets! Reblogged this on CAFOD Southwark. Fascinating, descriptive, really entertaining and funny! Thanks stephanie and team keep up the good work. This just looks amazing Steph! God Bless!